An Island of Rattlesnakes: What Could Go Wrong? A plan by the state to establish a colony of venomous timber rattlesnakes on an off-limits island in Massachusetts’ largest body of water has some rattled by visions of dangerous serpents slithering through the surrounding woods, attacking hikers, fishermen and hunters. Those are completely irrational fears based on the public’s aversion to snakes, said Tom French of the state Division of Fisheries and Wildlife…. “People are afraid that we’re going to put snakes in a place of public use and that they are going to breed like rabbits and spread over the countryside and kill everybody,” he said. Yes. That is the concern that arises when you propose giving rattlesnakes their own island on which to breed. There are only about 200 of the endangered snakes indigenous to Massachusetts left in five scattered pockets from greater Boston to the Berkshires, French said. 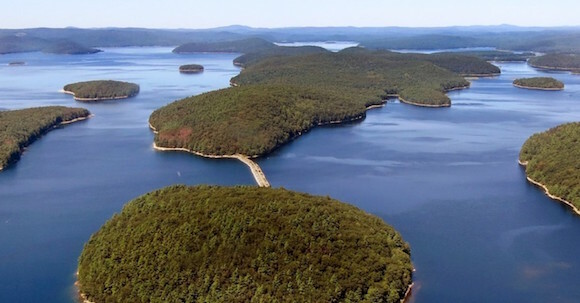 Loss of habitat and human-caused deaths means they could disappear altogether, which is why the Quabbin project is so critical. But wait! If I lived in Massachusetts, as I did quite a few years ago, I would consider the absence of rattlesnakes a good thing. As I am sure a large majority of Massachusetts residents do today. The public’s concerns stem from the fact that rattlesnakes can swim and the island is connected to the mainland by a pair of narrow causeways, French said. Okay… Seems like a legitimate concern to me! Rattlesnakes are timid and only strike out when provoked. There have been no documented rattlesnake bite deaths in Massachusetts since colonial times, he said. Rattlesnakes are timid? Seriously? There is a good reason why there have been no documented bite deaths since colonial times: residents of Massachusetts have ruthlessly killed rattlesnakes! Is this not blindingly obvious? On Mount Zion, the snakes will be safe from human interference, have ideal places to hibernate and plenty of mice and chipmunks to eat. Well, yeah. Until they encounter human hikers and so on. It’s one thing to be petrified of garter snakes of the sort we have in Minnesota, something else to be petrified of rattlesnakes. Some fears are rational. It strikes me as beyond weird that public employees–people whose salaries are paid entirely by you and me–are dreaming up new ways to multiply the population of rattlesnakes. Shouldn’t they be on our side?